New Year's day is when most people take stock of their life and figure out changes they want to make to improve the quality of it. I feel that life is lived to its fullest through travel, writing, music, food, wine, gardening, mushrooms, family, our pets, laughter, and love. And over the past twenty-four years Larry and I have refined our daily life to emphasize what is most important to us. 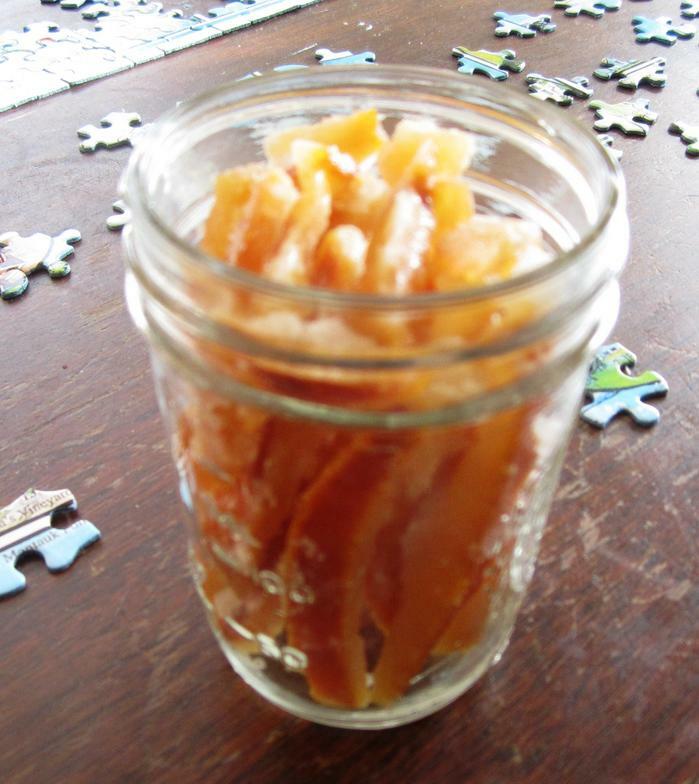 So today life is all about Quince paste, candied orange peels, lasagna, new moon list, and puzzles. Yep, while most people were still snuggled in bed this morning, Larry was boiling his prized three ripe quinces while I wrote our new moon list and worked on a wonderful puzzle. Larry is at his happiest when working on a new recipe with novel ingredients, and his excitement was palpable when he discovered the quinces at a store in Burlington. As soon as we arrived home, out came the cookbooks and soon my computer was filled with tabs of recipes for turning this fascinating fruit into an ideal cheese accompaniment. Once the mixture had turned a beautiful pink/orange color and a channel made with the spatula did not fill back up, Larry took the pan off the heat and filled a bowl and a La Creuset mini tureen (gift from Jackie). The end product tastes delicious and next time we will add a little less sugar. Dinner will be lasagna with some of my fresh made ricotta and Larry's homemade lasagna noodles. Life is good. May your 2014 be filled with everything that makes you happy, healthy, and loved!